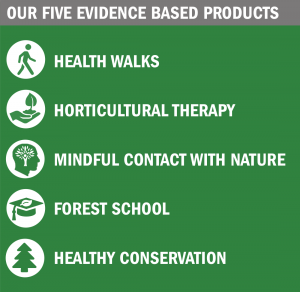 Our five evidence based products use the natural environment as the basis for their delivery and effectiveness. These products promote wellbeing, encourage self-care and have the potential to assist in the prevention and treatment of some health conditions as part of a package of healthcare. These products have been developed, tested and evaluated under pilot programmes such as Nature4Health and Natural Choices. Walking activities tailored to individual needs and designed to help meet target exercise and physical activity levels whilst improving mental wellbeing. Walking is one of the easiest ways to get more active, lose weight and become healthier breaking down barriers to positively influencing behavioural change. Gardening and food growing activities in a social setting. Encourages moderate physical activity, and improves mental wellbeing through the nurturing of plants, giving a sense of purpose and achievement as well as the opportunity to connect with others reducing isolation. Specifically developed nature based mindfulness practice. Delivered in local woodlands which support full immersion in the natural environment. Focused on individuals with mild to moderate mental health issues for whom mindfulness practice may form part of a programme to improve mental health and increase resilience from day-to-day triggers of stress, depression and anxiety. Shown to increase capacity to self-manage long-term chronic conditions. Targeted at increasing physical activity and improving mental wellbeing of young people. Forest School is an innovative approach to outdoor play and learning, inspiring individuals of any age through positive outdoor experiences. By participating in engaging, motivating and achievable tasks and activities, in a woodland environment, each participant has an opportunity to develop intrinsic motivation, emotional and social skills. Improving a participant’s strength and stamina through nature-based conservation projects, boosting practical skills and confidence, increasing physical activity and building social networks whilst benefiting local green spaces.